3rd Battalion - 1st Ersatz Battalion Company from 7th Grenadiers, 50th and 155th Infantry Regiments. 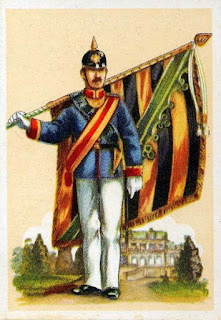 2nd Battalion - 1st Battalion 19th Landwehr Regiment. 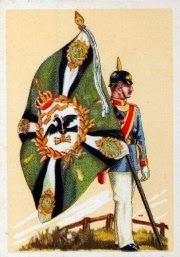 Formed from the 2nd Occupation Regiment (Posen). 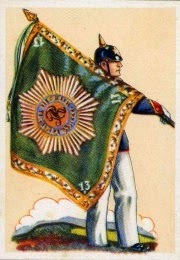 1st Battalion - Formed from the Ersatz Companies of the 6th Grenadiers and the 37th Fusiliers. 2nd Battalion - Formed from the Ersatz Companies of the 47th Infantry and 6th Reserve Infantry. 3rd Battalion - Formed from the Ersatz Companies of the 1st Ersatz Battalion of the 19th Infantry. 1st Battalion - 2 Coy from Ersatz Battalions of 6th Grenadiers and 37th Fusiliers. 2nd Battalion - 2 Coy from Ersatz Battalions of 47th Infantry and 6th Reserve Infantry Regiments. On 13th June 1915 the Regiment was renamed as the 329th Infantry Regiment. 165th Infantry Brigade, 83rd Infantry Division. 1st Battalion - 2 Coy 85th Infantry Regiment and 86th Fusilier Regiment. 3rd Battalion: 2 Coy 76th Infantry Regiment, 1 each from 39th and 89th Regiments. 1st Battalion - 2 companies each from 27th and 165th Infantry Regiments. 2nd Battalion - 2 companies each from 26th and 93rd Infantry Regiments. 3rd Battalion - 2 companies each from 72nd and 153rd Infantry Regiments. 1st Battalion - 13th and 14th Coy 139th and 179th Infantry Regiment. 2nd Battalion - 13th and 14th Coy 104th and 181st Infantry Regiment. 3rd Battalion - 13th and 14th Coy 133rd and 134th Infantry Regiment. 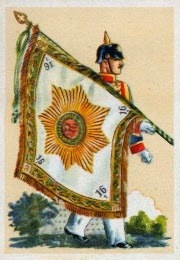 The Regiment was formed as the 2nd Guards Replacement Regiment. 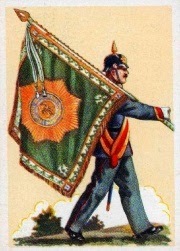 On 1st August 1915 it was renamed the 7th Guards Infantry Regiment. On 8th September 1916 the 2nd Battalion moved to the 399th Infantry Division, and became its 2nd Battalion. The 6th Guards Infantry Regiment was formed as the 1st Guards Replacement Regiment. It was part of the Guards Replacement Division. 1st Battalion: Was formed from the 1st Guards Brigade Replacement Battalion. 2nd Battalion: Was formed from the 2nd Guards Brigade Replacement Battalion. 3rd Battalion: Was formed from the 6th Guards Brigade Replacement Battalion. On 14th July 1915 the Regiment was renamed as the 6th Guards Infantry Regiment. On 8th September 1916 the 1st Battalion was used to form the 1st Battalion of the 399th Infantry Regiment. On 23rd September 1918 the Regiment received the 7th Mine Thrower Company. The Regiment was formed in Freiberg on 1st October 1912. At the start of World War One it joined the XII (I Royal Saxon) Corps. If formed one replacement battalion and two recruit depots. The Regiment was part of the 23rd (1st Royal Saxon) Division, as part of the 46th Infantry Brigade. On 1st April 1915 the Regiment was moved to the 245th Infantry Brigade of the 123rd Infantry Division. On 8th September 1916 the Regiment was moved to the 177th Infantry Brigade of the 216th Infantry Division. On 22nd April 1917 it was part of the 86th Reserve Infantry Brigade, 216th Infantry Division. On 21st August 1917 it was moved to the 408th Infantry Brigade, 212th Infantry Division. It was with that division when the war ended. 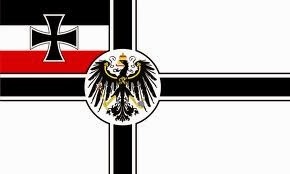 The Regiment became part of the 10th Infantry Regiment, as the 2nd Battalion in the Reichswehr. The Regiment was mobalised as part of the 88th Infantry Brigade, 40th Infantry Division, part of XIX (II Royal Saxon) Corps. 1st Battalion - 4th Battalion 19th Grenadier Regiment and 125th Infantry Regiment. On 1st October 1913 the Regiment formed a 3rd Battalion and a machine gun company. On mobalisation in 1914 the Regiment formed two recruit depots and a replacement battalion. In 1914 the Regiment provided two recruit depots and units to the 47th Brigade Replacement Regiment. 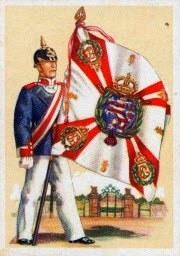 The Regiment was mobalised as part of the 47th Infantry Brigade, 24th Infantry Division, XIX Corps. On mobalisation in 1914 the Regiment provided four companies to the 64th Brigade Replacement Battalion. The Regiment was part of the 64th (6th Royal Saxon) Infantry Brigade, 32nd (3rd Royal Saxon) Infantry Division, part of the XII Corps. The Regiment provided four companies to the 64th Brigade Replacement Battalion. The Regiment mobalised as part of 64th Infantry Brigade, 32nd Infantry Division, XII Corps. On mobalisation the Regiment provided four companies to the 87th Brigade Replacement Battalion.